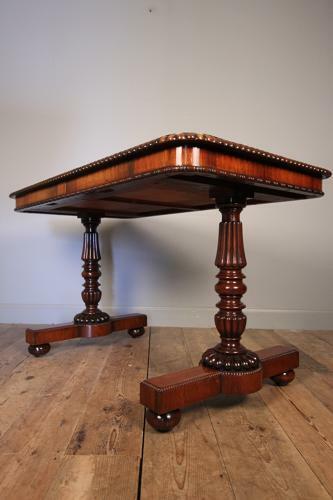 An exceptionally fine Rosewood Library Table by Gillows, having a moulded gadrooned top with 2 freize drawers. Raised on the iconic reeded column supports, terminating in squat bun feet of which retain the original sunken castors. Superb colour and lustre throughout this beautifully proportioned table. English, Circa 1825. We share the original Gillows drawing from the sketch book illustration showing a similar table and dated 1828. *Gillows of Lancaster & London was one of the most prestigious furniture makers in England throughout the 18th and 19th century, importing and working with only the finest quality timbers and craftsman. Pieces of Gillows furniture can now be seen in museums in London and Leeds as well as a collection in the Gillows Museum in Lancaster and Tatton Park.